Cost: $275, or $225 if registered by December 15th, or $250 if registered by January 9th. Register or for questions: Call Flourish Studios at 415- 800-4923 or email comeflourish@gmail.com, flourish.com/happenings/#/taichi/; or Call Dr. Mayer 510-849-2878. For information on the content of the workshop, email drmichael@bodymindhealing.com. For any people coming from out of town who are looking for a hotel in the area to stay please click this link for nearby hotels. Become initiated into how Tai Chi Chuan stems from an ancient lineage of postural initiation which includes four dimensions of purpose: self-healing, spiritual unfoldment, self-defense, and changing your life stance. This perspective, stemming from Dr. Mayer’s research, imaginal mythopoetic exploration, and thirty years of practice from some of the world’s most respected Tai Chi masters, will be applied to the Yang style Tai Chi set. Beginners, more advanced practitioners, and Tai Chi teachers will gain new perspectives and new entryways into the treasures of Tai Chi as a life long practice. • Broaden your view of the purpose of movements of Tai Chi, and experience how practicing Tai Chi Chuan using these four dimensions deepens your practice. • Cultivate Tai Chi’s unique ability to simultaneously revitalize and relax as you practice specific self-healing movements and postures for your life-time preventative medicine program. Synchronize breath and movement, develop balance, evoke deep states of equanimity. • Use Standing Meditation Qigong as a spiritual foundation practice for Tai Chi. It adds an energetic component that can be transferred to your sitting meditation and yoga practices. • Discover how Tai Chi two-person Self-development practices (called “pushing hands”) are initiatory pathways into enhancing your stance with others and embodying the elements of life. • Make Tai Chi come alive with Tai Chi Dance, as you find the primordial animal forms of Qigong hidden in Tai Chi movements. • Learn to cultivate the spirit and the soul of Tai Chi! Recommended Books,DVD, and articles by Michael Mayer: Secrets to living younger longer: The self-healing path of Qigong, standing meditation, and Tai Chi; Energy Psychology: Self Healing Practices for Bodymind Health, (North Atlantic/Random House. DVD: Bodymind Healing Qigong (DVD). Orinda, CA: Bodymind Healing Center. Bodymind Healing Qigong DVD. Two articles available free with opt-in to www.bodymindhealing.com: (1.) What do you stand for? The Journal of Qigong in America, Vol. 1, 2004, Summer. (2). 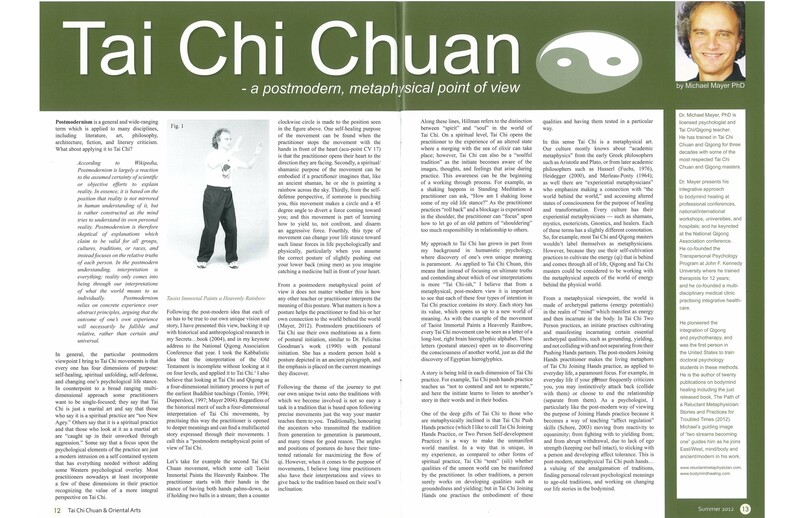 “Tai Chi Chuan: A Postmodern, metaphysical point of view,”Tai Chi Chuan & Oriental Arts, Summer, 2012. (3). For Sunday Workshop: Article on “The Mythic Journey Process”download free from www.bodymindhealing.com (instructions given with registration). Tai Chi Chuan: A Postmodern, Metaphysical Point of View, Tai Chi Chaun& Oriental Arts, Summer 2012. Standing Meditation: What do you Stand for? The Journal of Qigong in America, Vol 1, Issue 1, Summer 2004. Introduction: The Four Levels of Healing Purpose to Tai Chi Movements. • Introduction to Movements from the Long Form of Tai Chi-Chuan- 4 Dimensions of Purpose. Michael Mayer, Ph.D. presents his integrative approach to Tai Chi Chuan/Qigong at conferences, hospitals, and in his Bodymind Healing Certification Programs. Michael is author of twenty publications, including three books on integrating Tai Chi/Qigong with Western bodymind healing methods. www.bodymindhealing.com. • Movements from the Long Form of Tai Chi-Chuan- 4 Levels of Purpose. 1.) Demonstrate and discuss how the four levels of purpose of Tai Chi Chuan apply to at least two Tai chi movements. 2.) Name one type of breathing and one Tai Chi movement that can be helpful to hypertension. 3.) Describe one animal form of Qigong that is similar to a Tai Chi movement. 4.) Name one other culture and tradition of postural initiation which has an orientation to cultivating the vital energy of life. Bio: Michael Mayer, Ph.D. Michael’s Taiji Qigong background includes training for over three decades in the internal martial arts at the Integral Chuan Institute with master Fong Ha where he learned Taiji Quan, Xing Yi Chuan, and Yi Chuan. Some of this training includes Taiji sword, saber and staff, the 108 long form of Taiji Quan right and left sides, the long form of San Shau, and Yi Chuan with Grandmasters Han XingYuan, and Sam Tam. Two person “joining hands” (pushing hands) practice has been part of the curriculum. Michael has also trained with many other masters of medical Qigong such as Dr. Alex Feng in the Five Animal Forms of Hua Tau. He has been a colleague an friend of Ken Cohen, where many practices were mutually exchanged; for example Michael was the first person to teach Ken the Yi Chuan Standing Meditation Qigong. Michael received a certification in Chinese Health Arts from the Acupressure Institute of Berkeley, CA. Michael teaches his Taiji/Qigong workshops and classes at professional conferences, hospitals, and universities. He taught a three semester course at John F. Kennedy University called Tai Chi, Qigong, and Psychotherapy; and at The California Institute of Integral Studies he taught two graduate classes on Tai Chi, Qigong, and Energy Medicine. He keynoted the National Qigong Association conference, and has presented many workshops for the NQA including Tai Chi Chuan: Four Levels of Purpose. Michael was chosen to do a master level workshop at the Eleventh World Qigong Congress in San Francisco (2008). He has offered his Qigong workshops for world-renowned Esalen Institute; and he has certification programs, which include Bodymind Healing Qigong for Qigong practitioners/teachers, and a Bodymind Health Practitioner’s Certification Program for health professionals.